In general, I tend to read books that are quite closely related to my research (Joe Henrich’s The Secret of Our Success is on my desk, nothing surprising there) or ones – generally fiction – that have nothing to do with it (Station Eleven and Americanah are both half-read on my kindle, waiting for better times). More rarely I try to delve into academic essays on subjects I am only half familiar with, but I might plan to do it more in the future. In fact I just had a very nice surprise with Addiction by Design. Machine Gambling in Las Vegas written by MIT anthropologist Natasha Dow Schüll. Beside some – probably mandatory for an anthropologist – references to Foucault, Derrida, & co. scattered here and there, the book makes for a terrific reading. “Addiction by design” is a result of a long term ethnography among machine gamblers in Las Vegas. You get to meet people that spend a big part of their life (and certainly the majority of their savings) playing video pokers or electronic slot-machines, a world almost completely unknown to me. Their stories and their, usually extremely lucid, considerations on their addiction are worth the reading, but what made me think to write this post are the first two sections of the book, where Dow Schüll explores how the addiction is carefully engineered by designers, programmers, and psychologists working for the producers of the machines and for the casinos, at an astonishing level of detail. Everything inside a casino, from sounds to temperature, or to the fact that windows are absent and corridors are usually maze-like (both to accentuate the sensation of separation from the “outside world”) is the result of careful planning and experimentation. The most interesting bit, however, is the functioning of the machines themselves and, in particular, how the appearance of electronic slot machines opened new possibilities of tickling players’ psychology. Old slot machines were mechanical devices with limited space for engineering. For example, for the machine being valuable (by the casino point of view…), the amount of the highest jackpot needed to be lower than the number of “spaces” for symbols powered to the number of reels (that’s the probability that one particular combination of symbols will appear). A machine with three reels and twenty-two spaces for symbols – the standard – could not offer a jackpot higher than 10,648 (i.e. 22*22*22) times the coin played. Of course, the higher the jackpot the bigger the appeal, but, at the same time, players were suspicious of machines with more reels or more symbols, as they intuitively grasped that the probability to win were lower. Electronic slot machines brilliantly solved this problem, as reels became virtual and the need of a physical mapping disappeared: now a particular “lucky” symbol could be programmed to appear with any desired lower probability, increasing the jackpot indefinitely. Another trick made possible by electronic slot machines was to disproportionately augment the appearance of quasi-wins, that is, the presence of lucky symbols just below, or just above, the actual – usually not winning – central sequence. It is pretty clear why this would not be possible in a mechanical device, and how this intuitively appeals, again, to the psychology of players. Of course, one can gather data on the time and the money spent by players, and optimise the probability of quasi-wins in the machine, as too many of them can have the opposite effect, and produce a frustrating experience. A last example concerns the fact that producers of machines discovered that usual players, which are their main target, prefer steady and small wins to rare and high ones (even though, as said above, these need to be possible and the higher the better). In other words, their goal is not to get rich and go to Maldives (this was my naive image of casino players), but to play the longest possible, having continuos small reinforcements, or, as Dow Schüll calls it, staying the longest in the zone. 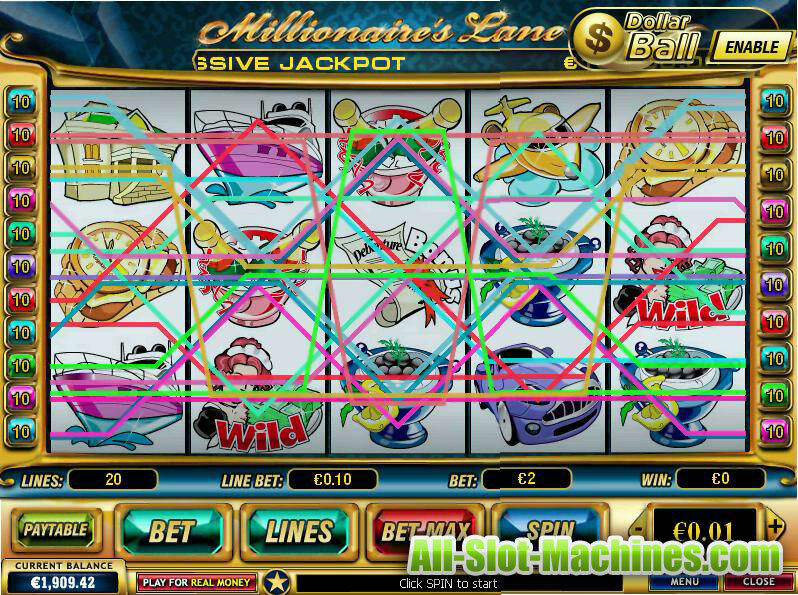 This led to the proliferation of machines with multiple lines and several possibilities of winning (see the example below, the Millionaire’s Lane Slot, with 20 different “lines” where the player can win). In fact, the minimum possible bet decreased with time for slot-machines, but now it can be multiplied, as in the example, through several lines, producing a continuos series of small wins. All this made me think to recent discussions I had about the concept of cultural fitness. Slot machines are explicitly engineered, and their success depends to their appeal to psychological factors. These factors are independent, to a large extent, to cultural dynamics. Slot machines that, with the same number of reels and symbols (or that make the players believe it), offer an higher jackpot are more successful that slot machines offering a lower jackpot. This is due to “external” psychological factors: the explanation is not circular (if all this sounds very mysterious, please have a look here). “Addiction by design”- or a large part of it – can be read as a thorough investigation on how cultural fitness is carefully programmed, in a very specific case. This is often referred to as “memetic engineering”. Most students of cultural evolution in academia don’t seem to have looked at this very much so far. There has been a curious bias in the field towards studying ancient history – and how culture influenced human evolution long ago via gene-meme coevolution. By contrast, deliberative engineering of both genes and memes has become more prominent in modern times. With memetic engineering, there isn’t so much of a gene-meme coevolution story to tell – since most of the action is in the cultural domain and, to a first approximation, human genes serve as a static background. Hi Tim, thank you for your comment. I guess that, terminology beside (which is probably not too important in this case…) we are on the same page here.